In this section, we are going to go over all the technical things you have learned so far, tie them all together, learn about the “improved harmonic patterns” or otherwise known as “advanced price patterns”. The reason we like to calling these patterns improved patterns is because, well, they have improved from the patterns we have covered so far. The AB=CD, the three drive, flag, pennant and all the other patterns known as “simple” or “basic“ patterns are great when combining them with other technical things such as structure analysis, ratios and indicators. The Improved patterns hold their own so to speak; this does not mean that we abandoned all the structure analysis and ratios, no they are still in place, in fact, they will be improved hence the “improved” name patterns. The improved patterns work purely on structure and ratio analysis but can be a little tricky to identify at times, but don’t worry, by the time we close out this section you will become an expert on how to spot these patterns, how they work and why, and finally how to trade them, stops and targets included. When it comes to these patterns in general, it is often not the rules of the pattern that are the complicated part or even the identification of the pattern itself; the hard part is identifying them the right way with clear structure in mind. People that have no understanding of structure, support and resistance and ratio analysis are most often the people that are the quickest to jump to the conclusion of: “These patterns do not work, I am losing money trading this bulls***.” The simple reason for people failing when it comes to trading Improved Patterns and trading in general is, they have not put in the effort or education when it comes to training or trading these kinds of patterns. Let us share with you a real fact! 90 – 95 % of all traders fail! Why do 95% of all traders fail? By this point we are sure you know the answer: 95% of people treat trading like going to the casino, they have no idea what trading is or what it is all about. They saw some scammer on YouTube or Google talking about how easy it was making millions in the Forex or stock markets. All you need to do is choose a side, up or down, right! This could not be further from the truth; we can just see the big hedge funds managers walk into work with trillions on the line: So, Mike do you want to go up or down today? Let me flip a coin; they tend to work pretty well! 5% of successful traders know what they are doing, they assess the risk to reward, identify structure, news, ratios, patterns and all the thing that differentiate trading from simply going to the casino. Let me share with you another fact! 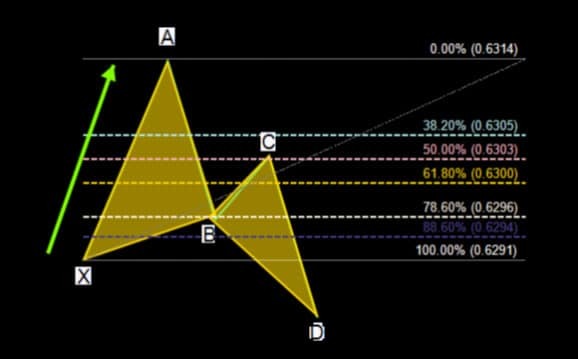 The Gartley pattern has initially been “created” by H.M. Gartley and was featured in his book “Profits in the Stock Market”, which was published in 1935. The book did not specify any Fibonacci ratios; it was not until the release of The Harmonic Trader by Scott M. Carney that the ratios came to life. The pattern consists of two 61.8 retracements and one 127.2 extension. Let’s see how the pattern looks like and check on the rules we set for it. Note: Green and purple arrows on the chart indicate the direction to draw the Fibonacci Ratios. The most common way when seeking for targets on any of the Improved Patterns is using Fibonacci ratios. 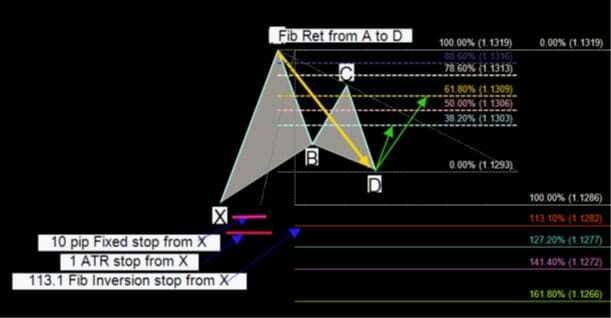 In the case of the Gartley, we use the fib retracement from A – D.
Note: Remember that adjusting your targets may be required if the market does not reverse on a dime at the entry point. This is done by drawing your fib retracement lower (the wig of the smallest candle from D point). When setting stops at the Improved Patterns, there are three ways. We will go over all three, and we will then inform you about our preferred one. Remember, even though we prefer one over the other does not mean that this is the “right” way, it just fits into our style of trading the improved patterns. You need to do a bit of backtesting your strategy or system. You must begin to mould your mind to the concept that you will need to do all these things on your own and find out for yourself what is best for you. Fixed pip stop = In the case of using a fixed pip stop you would use a number of pips as your stop. This n. of pips will always be the same, i.e. ten pip stop on the 15 min chart. You might want to increase then of pips as you go up in timeframes, i.e. 30 pip on the 4-hour chart. As always you must find your golden n. of pips you want to use for stops in your backtesting results. 113.1 Fib inversion stop = The inversion is measured from A – X leg. This stop is usually around the ATR stop and is an excellent way of stop placement if you cannot beat the charts when the pattern is completing (The ATR cannot be read correctly if the candle has not touched the entry), but you do want to get a general idea of the ATR area. ATR stop (our preferred halt) = We use the ATR stop in all our trading; the reason is that it is dynamic and changes with market condition. Whether using 1, 2 or more ATR stops is up to you and your backtesting results. There are of course pros and cons in using Fixed, fibs or ATR stops, the most important thing to remember is BE Consistency. Do not use fixed stop one day and ATR or Fibs the next. You need to get a decent idea of how the market moves, choose a stop and stick to it! 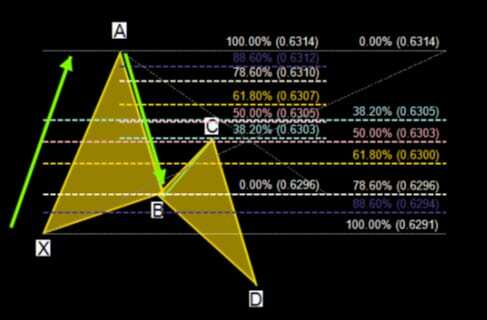 The Bat pattern, discovered by Scott M. Carney in 2001: The pattern consists of three different Fibonacci ratios, the 50, the 61.8 and the 88.6. The bat is one of the best patterns when it comes to R to R and is personally our favourite for those reasons. Let’s see how the pattern looks like and check on the rules we set for it. Rule n. 1 = Fib retracement from X – A. The retracement (a – b) must touch the 50.0 fib but can NOT touch the 61.8 retracement (wig included). Rule n. 2 = Fib retracement from A – B. 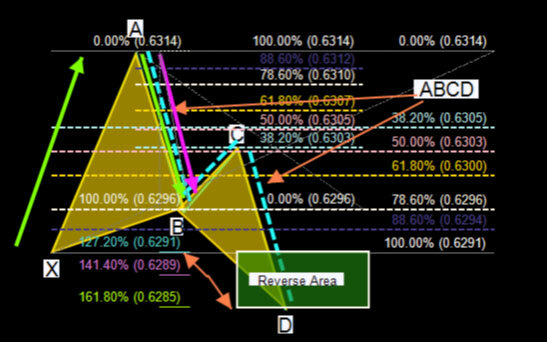 The retracement (b – c) must touch the 61.8 but cannot exceed A (wig included). Targets are found in the same way as the Gartley. 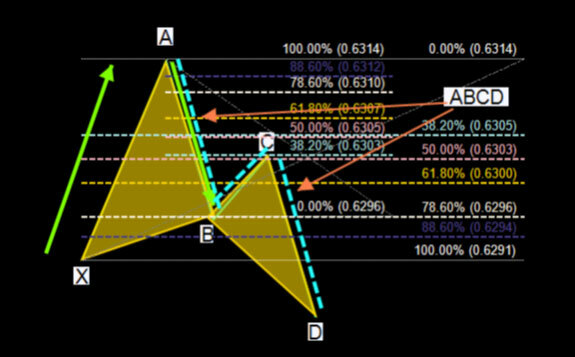 In the case of the Bat, we use the fib retracement from A – D (Remember to adjust targets if necessary). We use the same stops in all the Improved Patterns. Brice Gilmore initially discovered the Butterfly pattern, however like in the patterns before it was not until Scott M. Carney set the ratios into the pattern that the Butterfly as we will learn it was born. The pattern consists of a two/three Fibonacci ratios, the 78.6 and the 38.2-50.0, and one Fibonacci extension, the 127.2; we also use the AB=CD pattern also to give us an area of the potential reversal. Unlike the Gartley or Bat, the D completion leg completes outside of our X leg. 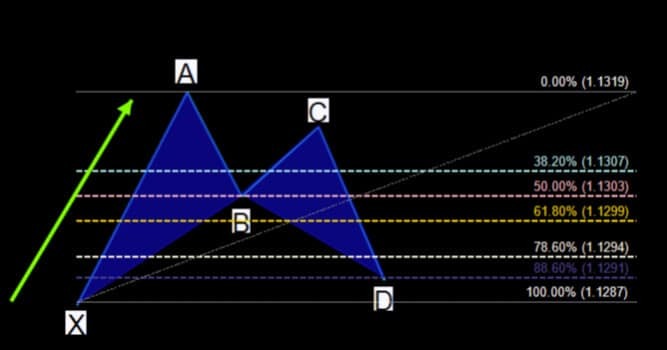 This can be a problem because X is our structure point and with D achieving outside of X this makes for some mixed signals because as we know from our previous training on structure analysis when structure breaks we should expect a continuation to the up/downside. For this reason, we need more structure to take a Butterfly pattern. Let’s see how the pattern looks like and check on the rules we set for it. Also, we will go over the structure requirement we need for the Butterfly. Rule n. 1 = Fib retracement from X – A. The retracement (a – b) must touch the 78.6 fib but can NOT go beyond X (wig included). Rule nr. 2 = Fib retracement from A – B. The retracement (b – c) must at least touch the 38.2 but cannot exceed A (wig included). Rule n. 3 = AB=CD must be drawn on, that will be our D completion leg. Thus creating an area from the bottom of the AB=CD to the 127.2 extension. As we told you in the intro to the Butterfly, we stated that we needed more structure to take the Butterfly Pattern. Often time the Butterfly does not have the structure that we need, and in those times we do not trade them. This does not mean that you need to do the same, but as always, this is something you will need to find out in your backtesting result if you choose to trade the Butterfly. Let’s take a look at an example of a Butterfly we would trade. As you see in the example below, there is an excellent looking structure looking left. If we trade the Butterfly (which we rarely do), this is our requirement. You could do the same or set up other conditions, for example, DT/DB.